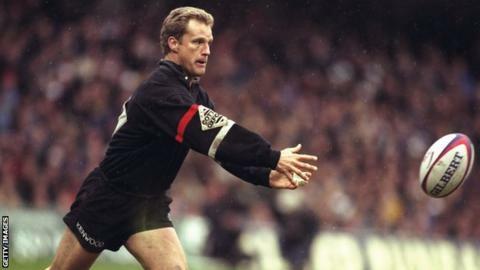 Former Australia and Saracens fly-half Michael Lynagh says it is "a miracle" he survived after suffering a stroke. Lynagh, who won 72 caps for the Wallabies before retiring in 1995, was admitted to hospital after falling ill in April 2012. "I was very lucky with just about everything that had to go right from the moment it happened," the 49-year-old told BBC Sport. "It's just my miracle basically and thank goodness for that." Lynagh was vice-captain of the Wallabies side who defeated England in the 1991 World Cup final at Twickenham. He captained Australia to the quarter-finals of the 1995 World Cup, then quit international rugby union to join English Premiership side Saracens at the start of the professional era. Lynagh recalled how after complaining of serious headaches and blurred vision he was rushed to the Royal Brisbane and Women's Hospital where he spent days in intensive care. "I'd arrived in Brisbane that day from Singapore, where I had a bit of work to do for three or four days, and sat down," Lynagh told BBC Radio 5 live. "I'd played golf that day with my father and a couple of friends. "I'd had a steak and was on my third light beer. One of the guys was telling us funny stories and I laughed, and as I took a sip, it went round the wrong way and I choked, and it was quite violent. "When I stopped that and tried to open my eyes I couldn't see. "Then I was just trying to get my sight back. I was dizzy, lack of oxygen, that sort of thing. "Then headaches kicked in quite strongly. I was taken into intensive care and was looked after very well, but I was very, very lucky to be here. "It was pretty tough but basically my back right artery had split, causing a clot." Lynagh is now looking forward to the British and Irish Lions tour to Australia in June. "There's a lot of water to go under the bridge between now and then, obviously, in terms of the Lions, and Australia," he said. "We've had a year where we've had a horrendous amount of injuries to the Australia team but we've coped with it. "We probably would have liked to have won some more games, but we coped. The interest in Australia is enormous." Listen to the full interview on 5 live Sport on Sunday at 12:00 GMT.